While most people tend to believe that the living space is the most popular hangout in any home, facts suggest that the honor well and truly goes to the kitchen. 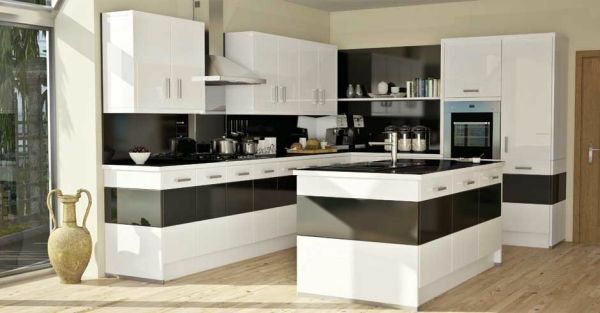 The reasons are pretty obvious thanks to the presence of sumptuous delights tantalizing your taste buds, but this also means you need to put in far more thought into what kind of vibe your kitchen exudes. 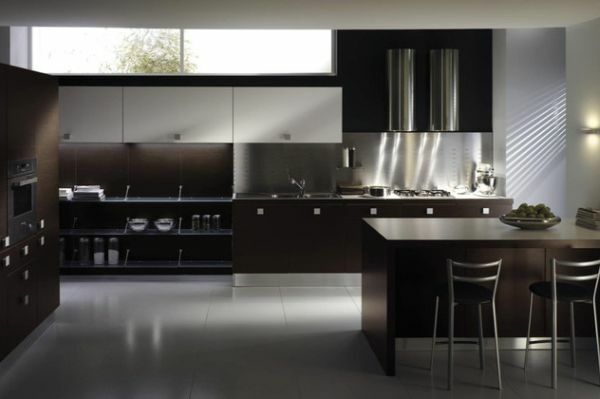 Modern kitchens can come in a variety of colors schemes and while a total overhaul is only needed once in a decade or so, regular updating and facelifts are a must. 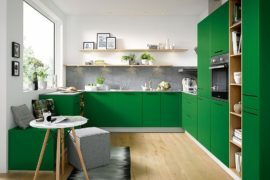 Here are 10 stylish, chic and contemporary kitchen color schemes that not only liven up your home, but also help you stay in tune with design trends of 2013! 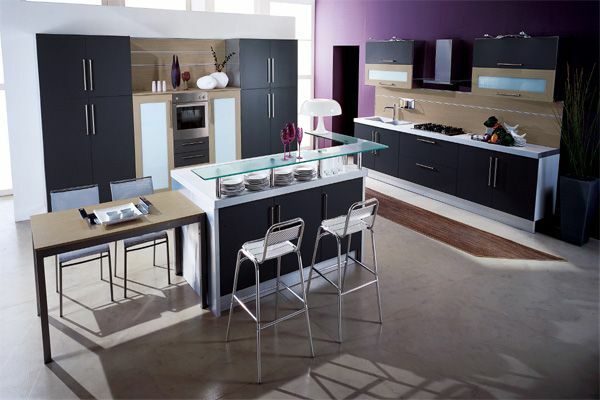 Here is a lovely kitchen that uses simple colors and neutral shades in a stunning fashion by simply adding a vivacious wall colored in purple as part of the kitchen backdrop. Elegant, rich and sophisticated, this design is ideal for those looking to strike a balance between modern minimalism and bold expressiveness and a touch of playfulness. 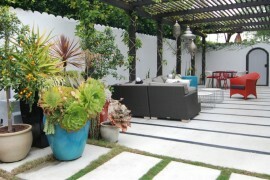 The smart use of glass creates a rather balanced and beautiful variance in this contemporary setting. 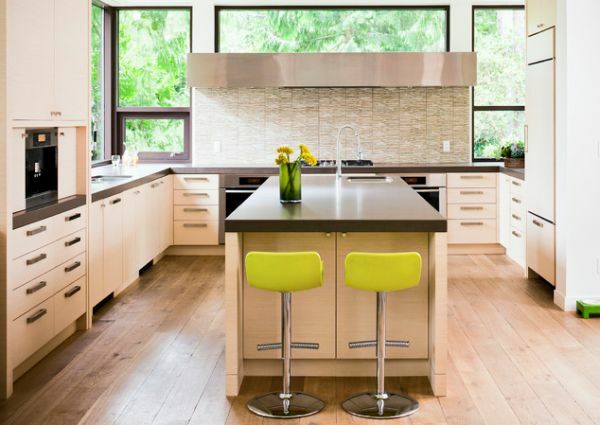 Warm, inviting and calming, the sporadic splattering of yellow in the form of interesting kitchen seating options and the fresh flowers gives this kitchen a unique and effervescent look. Despite using largely subdued shades, the kitchen stands out thanks to these daft little touches and with ample natural ventilation thanks to extensive use of glass, ‘fresh mornings’ is what this kitchen advertises with glee! From the bright and bubbly to the uber-minimalistic in dark overtones; here is a kitchen that is all about following the modern design outlook of clean and well defined lines combined with ergonomic shelves and smart gadgets. 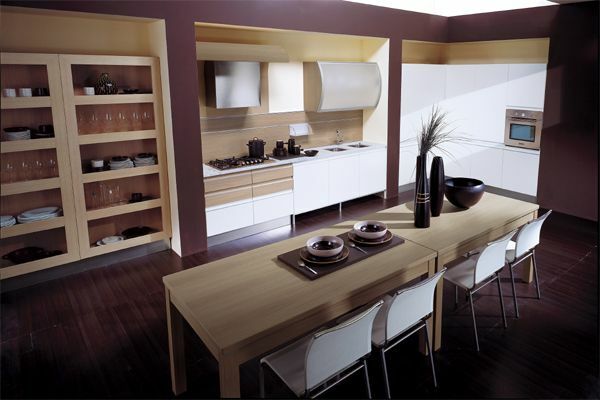 This kitchen is for those who see a darker and sober template as an ideal choice for their classy urban residence. Futuristic in appeal and fashionable to the core, this skillfully lit kitchen blueprint is a popular choice among home owners world over. 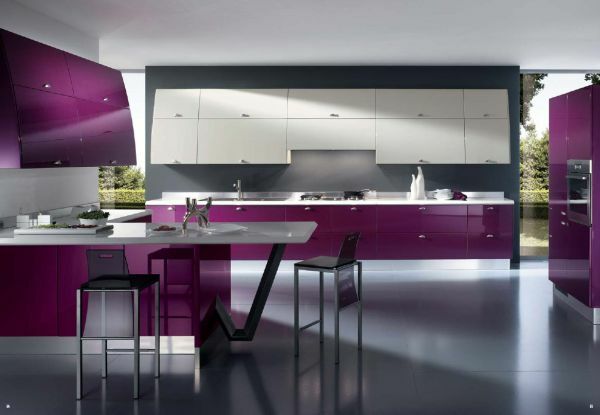 Trendy kitchen that is draped in a dazzling display of violet, this is an ideal kitchen color scheme for those who wish to incorporate plenty of zest and abundant liveliness while not giving up on the sleek and refined urban look. The gorgeous shelves, whether in violet or in white are the showstoppers here thanks to their distinctive presence, while the glittering countertop and exquisite arrangement add to their allure. Asian kitchen designs are pretty popular thanks to their distinctive form and the soothing effect they have on the surroundings. 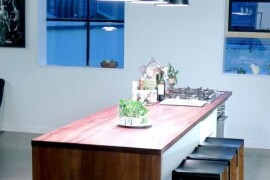 While not completely in that mold, this kitchen merges lovely a modern design with elements of traditional Asian kitchen such as warm, earthly tones, attractive wooden surfaces and classic shelf spaces with glass doors encased in a wooden frame to offer the best of both worlds. 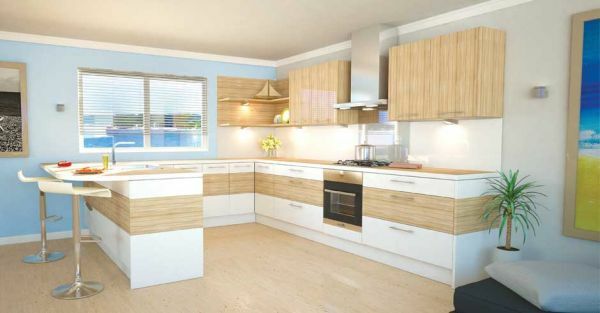 Aesthetic and ergonomic, this kitchen scheme is highlighted by its simple and serene aura. 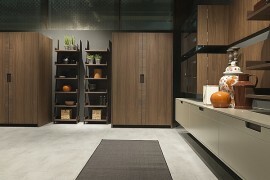 And now onto some of these modern kitchens from Wren Kitchens. The classic black and white color combination is something that never goes out of fashion and while its modern version might be a bit more distinguished and polished, it still has the same charm and attraction that draws you in without fail. This sparkling kitchen with its distinct island in the middle sports white shelves and a black countertop. The bold black band the cabinets sport offers the space its own inimitable lure. Smart and savvy. We all have our own personal favorites and this cool blue kitchen is our beloved thanks to its calm and laid-back look, magnetic appeal and picture-perfect presence that is neither too overwhelming not too understated. 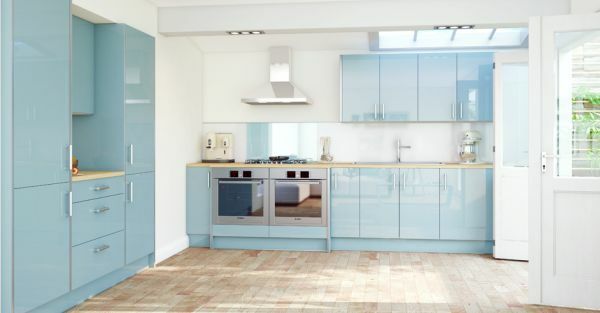 A stunning blend of style and substance, the ‘light blue cabinets’ that are nestled perfectly among a ‘pristine white’ setting offer a combination that many designers believe is as close to ‘perfection’ as possible. Both current and charismatic to the core! 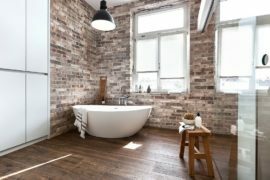 If you are one of those who loves the natural touch that ‘wood’ brings into your home, then this crafty combination of stone and wooden finishes seems like the design to emulate when you decide to go for a new kitchen. Light, airy and attractively lit by both ample natural ventilation and artificial lighting, this space has a refreshing atmosphere thanks to the playful wooden cabinets and even a touch of natural green; Ergonomic and elegant with natural goodness aplenty. 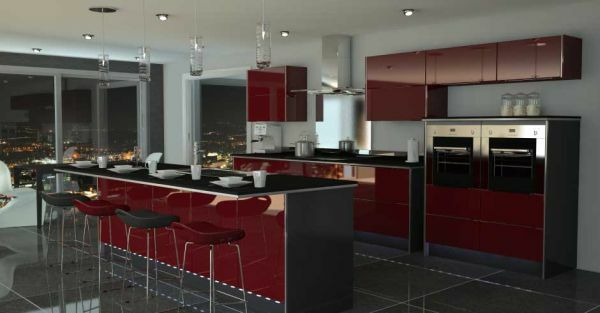 Red and black is another classic when it comes to kitchen design, just like the black and white combination above. But it takes plenty of thought and a great execution to pull this look off and this particular kitchen seems to have that in abundance. The glazed surfaces, the matching seating options, the floor-to-ceiling glass windows in the backdrop; all add up to offer the ideal setting and opulent richness. 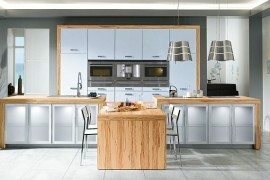 While in all the above kitchen designs we have seen a presence of vivid tones and glittering surfaces that draw your attention, the last one in the collection tones down the ‘oomph’ with natural shades and sober surfaces that stand out in their own unique way. 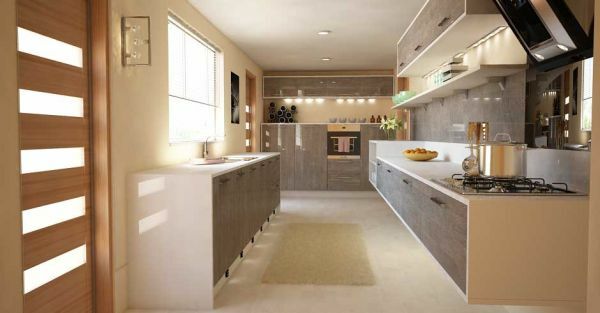 A fantastic kitchen plan for those who like the less ‘glitzy’ variants, this kitchen is spacious, graceful, craftily built and employs neutral colors to create a tranquil setting. Natural lighting and a lovely rug at its heart further highlight its exquisiteness.